Three Olympians headline the 12-member team that will represent the U.S.
From what we saw this past weekend, we’ve got a competitive women’s team with any of our women capable of battling in every distance. US Speedskating announced its 2016-17 Short Track Fall World Cup roster today following a weekend of action-packed racing at the Utah Olympic Oval in Kearns, Utah. 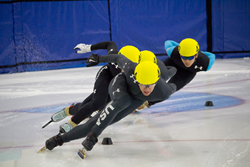 After the two-day meet, six men and six ladies earned roster spots for the first two ISU Short Track Speed Skating World Cups, which will be held on November 4-6 in Calgary and November 11-13 at the Utah Olympic Oval. Three-time Olympic medalist J.R. Celski (Federal Way, Wash.) leads the men’s team after a perfect weekend of racing, winning all four race events and all 15 heats he raced in. World Cup gold medalist John-Henry Krueger (Pittsburgh, Pa.) had an impressive weekend as well finishing second to Celski and will join him on the men’s team. Filling out the rest of the men’s roster will be Adam Callister (Salt Lake City, Utah), Keith Carroll Jr. (Honey Brook, Pa.), Thomas Hong (Laurel, Md.) and Ryan Pivirotto (Ann Arbor, Mich.). On the women’s side, two Olympians will headline the roster in Jessica Kooreman (Melvindale, Mich.) and two-time Olympic medalist Katherine Reutter (Champaign, Ill.). Reutter returns to the ice after ending a four-year retirement. Kimi Goetz (Flemington, N.J), who finished the weekend as the women’s leading point-getter in the first race of the American Cup series, returns to the World Cup team along with Katy Ralston (Saratoga Springs, N.Y.), Kristen Santos (Fairfield, Conn.) and April Shin (Rockville, Md.). Of the 12-member team, nine of them skated in an ISU World Cup during the 2015-16 season and all 12 athletes have ISU international racing experience. For a full roster with athlete’s hometowns, click here.